We knew Cyprus had what it takes to make premium extra virgin olive oil, but proving it would take time, preparation, and lots of help. On a typically beautiful winter night in November 2017, Colive founder Hasan and some of our first farmers approached the Morphou crossing with trucks full of plump, ripe olives. It was dark, and they were tired after a long day of harvesting. But once at the crossing, they discovered their work was not over. They were told they couldn't take their precious cargo across at that point; the only port that could conduct the necessary inspections was in Nicosia, about two hours away. The window of time was small-olives must reach the mill in 48 hours to achieve extra virgin acidity-so Hasan decided to head for Nicosia that night and try crossing again in the morning. The next day, Sunday, he set off alone to speak with officials before trying to drive the olives through again. While it turned out the team was in the right place, and the paperwork was in order, there was one more obstacle: the olives had to be totally “clean”- no branches, leaves or stems at all. Having already lost a night, it was all hands on deck. Hand-picking olives in Morphou/Guzelyurt. Hand-held electrical rakes help to pick the olives out of reach without any damages to trees. "Rushing the olives to the mill required all hands on deck and every resource we had. This operation may not have been glamorous, but it was totally worth it." Hasan, his 92-year-old grandma, uncle and cousins all came to help, and spent that day and into the night cleaning 800 kilos of olives, 40 cases in all. Necessity is the mother of invention, and the newbies got creative. Using a ventilator and two small buckets, they came up with an ingenious way to clean the olives faster. Finally, the cases were ready for inspection. Hasan's uncle came along to help at the port; having grown up in Paphos, he knew his Greek could be helpful. 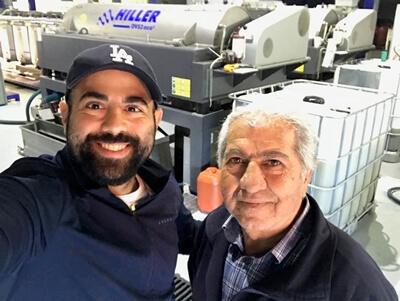 Hasan and his uncle at the mill, feeling relieved after successfully getting the olives there in the nick of time. The Colive olives becoming olive oil. Can you tell which spout's oil is from which side of the island? Bringing that first batch of olives from Morphou/Güzelyurt across the line to join the olives from Larnaca at the mill marked the culmination of almost a year of research, lobbying and preparation, including training as a sommelier in Tuscany. With that act complete, we became the first company to bring olives together across the divide between north and south Cyprus. We researched and coordinated with the best farmers on both sides of the island growing the local Kypriaki/Kıbrıslı/Cypriot variety of olive. Then, it was all about getting over regulatory hurdles in Cyprus, lobbying everyone involved with Green Line Regulation on both sides, and finally getting sign-offs from all parties. This achievement made Colive Oil the first to officially bring olives across the line in Cyprus. The native cultivar is less efficient than its mainstream counterparts, producing at only a 6:1 ratio of kilos of olives to kilo of oil, rather than the commercial breeds' 4:1, but the flavour profile of the Cypriot olives is a prize worth all the challenges. It's quality, not quantity that Colive strives for, truly a taste without limits. We hope you enjoy this delicious, unique olive oil that could never have happened anywhere else in the world.